As Southern California’s leading technology startup incubator, EvoNexus operates under a pro-bono model, providing mentorship, access to capital, and office space to its companies. But it is more than just an incubator – EvoNexus also connects its emerging technology companies with global businesses in the technology and life science sectors, venture capital, and a network of mentors with domain expertise that match the company’s needs. Since its founding in 2010, 18 startups under EvoNexus have been acquired, while 74% of its companies have received funding during incubation. In total, the organization has achieved over $1.3 billion in funding and outcomes (acquisition) with the companies in its portfolio. Startups in the EvoNexus program enjoy class A office, lab, and conference space in the incubator’s San Diego (La Jolla) and Irvine, California locations, provided in partnership with Irvine Company, the largest real estate developer in Southern California. 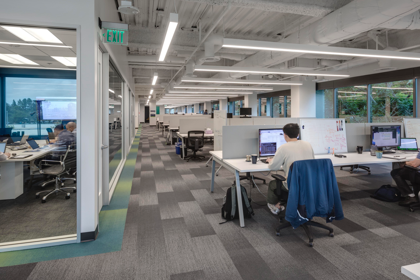 When EvoNexus recently moved into its new, second-floor space in San Diego, the incubator gained a modern, 18,000 sq. ft. collaborative workspace. However, due to AT&T cellular tower locations, some of its startups lost or experienced weak cellular coverage. This was particularly true for Water Pigeon, which delivers a fast, simple, secure way to implement automated water metering over cellular networks. With no indoor cellular coverage, the company had to resort to testing its product at an off-site lab, and was considering relocating its offices. “It’s impossible to run our product development business out of a location with no cellular coverage,” he says. EvoNexus co-founder and CEO Rory Moore contacted Nextivity, a company he has followed since inception. Nextivity’s Cel-Fi QUATRA™ enterprise inbuilding cellular solution could address the coverage issues. Cel-Fi QUATRA is an active DAS hybrid that combines the best of both active DAS and Cel-Fi Smart Signal Booster technologies. A scalable solution, Cel-Fi QUATRA is simple and cost-efficient to install. At the hub of the Cel-Fi QUATRA system is a Network Unit (NU), which provides the donor signal and provides Power over Ethernet (PoE) and RF over Ethernet (RFoE) to up to four Coverage Units (CU). Cel-Fi QUATRA CUs are the remote radio heads of the system that rebroadcast the donor signal. 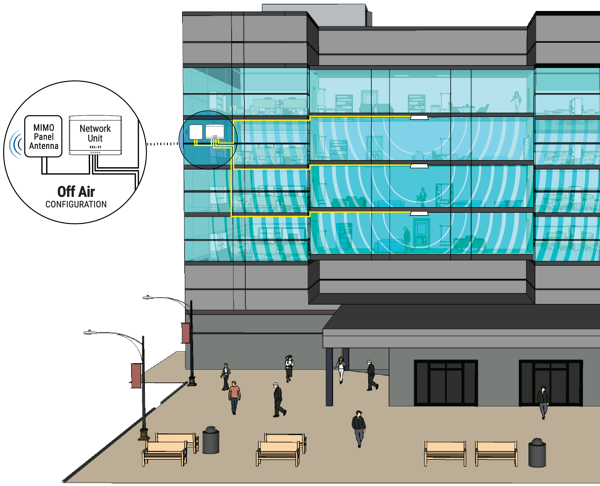 EvoNexus deployed three CUs operating in off-air mode, and a Cel-Fi MIMO panel antenna that was mounted indoors on an outside-facing pillar. Cel-Fi AntennaBoost integrates the antenna with the Cel-Fi WAVE platform to achieve the strongest donor signal possible. Coax cables connected to existing Cat5e infrastructure, accelerating the installation process.